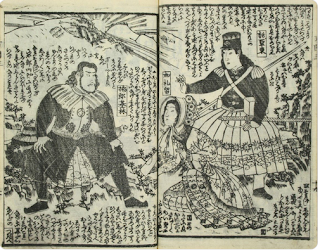 Historian of Japan Nick Kapur shares his discovery of an 1861 publication called Osananetoki Bankokubanashi (童絵解万国噺) by writer Kanagaki Robun and artist Utagawa Yoshitora that brilliantly indulge America’s foundational myths from a very different perspective (previously), filling in details that did not quite translate. Here is a relatively sedate scene of George Washington and his wife “Carol consulting with a young and spry Benjamin Franklin but other, more fantastic scenes include Washington and John Adams battling fiercesome tigers and an enormous serpent—that earlier devoured Adams’ aged mother during a picnic and a younger Washington taught the skill of archery by the Goddess of America. 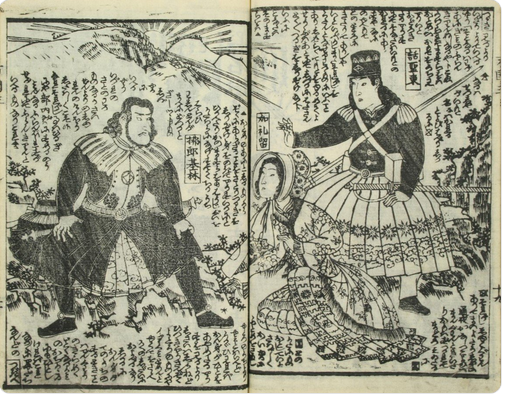 This book show that interest in the fledgling republic were still enduring at the cusps of its own civil war and nearly a decade since US Commodore Matthew Perry forcibly opened up Japanese ports to trade. Be sure to visit Nag on the Lake and Open Culture at the links above to learn more.